TheHand Held Reacher is a well constructed ultra-lightweight frame constructed of durable aluminum and plastic to resist wear while maintaining minimal 5.4 oz. weight. The jaws are easy to open and close with a light 7 ounces of pressure on the trigger. Using a reacher can help reduce injury from falling. 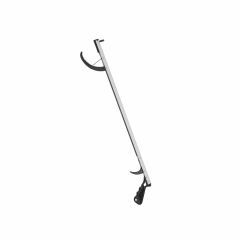 The aluminum reacher is lightweight but sturdy and will eliminate the need for bending,stretching, stepping up, or climbing to get those items that are just out of reach. Specially designed with a full handgrip to allow the use of all four fingers for greater grip strength. Choose from 26.5" or 32" Length or Folding 26.5" Length.